Personal development blogger Scott Young and his friend Vat decided to immerse themselves in language learning by going a year without speaking English. Their plan is to live in 4 different countries and thus see how much of 4 different languages they can learn in a year’s time. 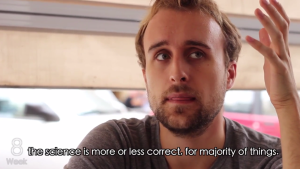 Learning Spanish in 11 Weeks | 10-Min Documentary from The Year Without English on Vimeo. I myself am learning Japanese right now, through a combination of an online class, Pimsleur audio courses, and watching アニメ (anime, aka Japanese animation). I would no doubt learn much more and faster if I took a year to live in Japan, but that wouldn’t fit with my other goals right now, so this will have to do! One thing I’ve found interesting about learning a new language in my 30’s is just how much pure memorization is required in language learning…and how little memorization is required of adults in general. In NLP trainings for instance, we never require anyone to memorize anything, even short phrases or scripts. Why not though? We expect high schoolers to memorize thousands of foreign language vocabulary words but expect nothing of the sort of adults. Perhaps we should set some higher standards for ourselves!